Sources at the end of post! 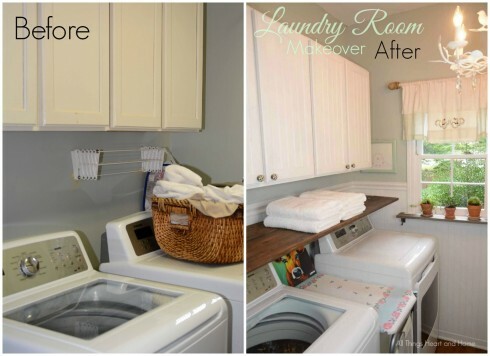 I’ve been wanting to do a laundry room makeover for months! 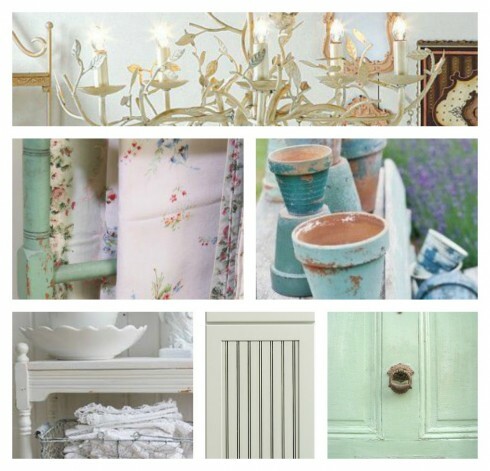 I planned out the room using vintage linens as my inspiration-(Below is my inspiration board) I’ve repurposed some blue and minty green vintage linens into art for the wall and a window valence, so those colors were my jumping off point. Since the room is small we wanted it lightened up a bit. 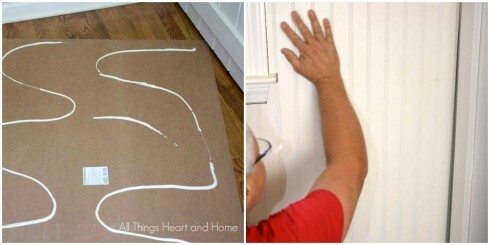 Bead board is a great way to brighten up a space. After a thorough cleaning Mike started putting up the bead board which involves measuring and cutting your desired height and cut-outs for outlets. 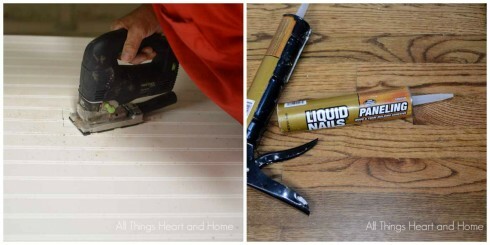 When everything was cut just-right, he used Liquid Nails to adhere the breadboard onto the walls and finished it off with moulding. He also added bead board to the front of the cabinets before we painted everything in a creamy white – Behr MARQUEE Cameo. And I am in love with my sweet cow canvas. I got it online for $29.00 but found it later for a lot less! 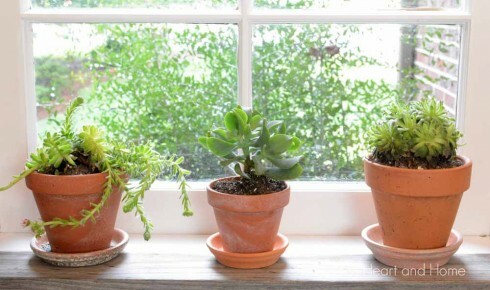 The other rustic shelf (which is pallet wood) holds a few of my succulents…you know how I love to add plants to my decorating…plants are an easy way to make any room happier! This makeover took only 2 (full) work days and we are thrilled with the way it turned out! Valance: Made from 2 old linen table cloths and a piece of an old pillow case! I love the bead board on the cabinets, it really dresses them up. Cutest room ever! I don’t know what it is about the start of a new school year, especially since I’m not teaching anymore, but I go into nesting mode and I find myself wanting to clean everything. I’ve been hearing about Tide Oxi and meant to look for it the last time I wen to the store. I’m going to the store today, so I’ll be sure to look for it. 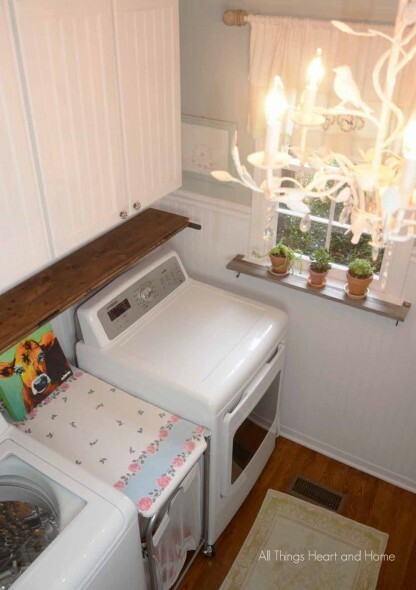 Your laundry room looks so fresh and clean and inspiring. 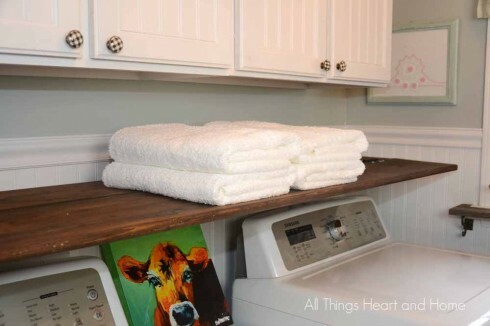 I can’t wait for the tutorial on the rustic shelf over the washer and dryer! Sharon …isn’t it the truth! As seasons change I’m compelled to declutter and deep clean…since fall is coming up, I know I won’t want to deep clean from October – December! Better do it now right!??? You’ll love the Tide OXI, I got mine at Home Depot…but then again, I get almost everything at HD! wanting to install bead board in our tiny laundry and I believe the task has gone up “the must do list”. What an amazing job!! You are a genius….Hubby too! What paint colors did you use? Love your laundry room as much as I love mine. I’ll share mine on Facebook. 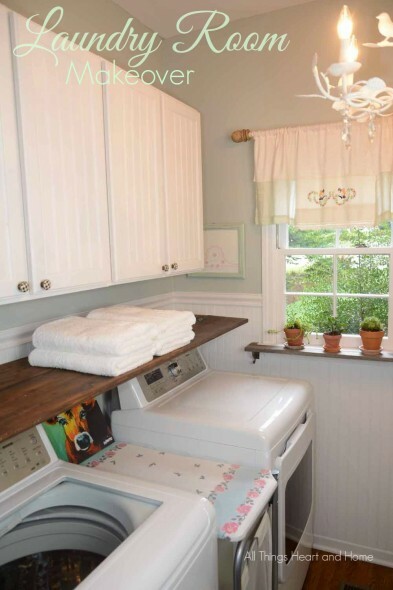 A nice laundry room makes doing laundry much more fun. I have always used Tide, but haven’t been able to find the Tide OXI at the store as yet. My washer has a cleaning cycle and I use Tide washer cleaner and use a paper towel to clean the basket edges and glass window after the cycle finishes. 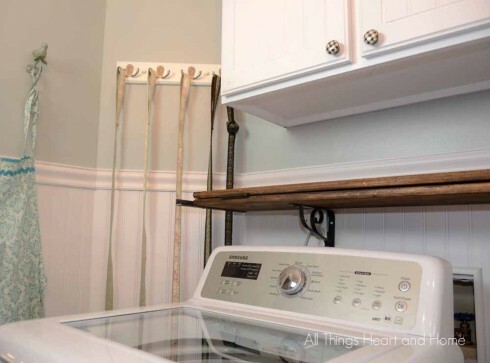 Your laundry room looks so pretty, love me some beadboard. I have wondered about adding beadboard to cabinet doors- did your hubby just glue it on top of what’s already there, or did he remove the panels inside the frame? Love your makeover! The room looks so bright and beautiful!! And I, too, love the beadboard… y’all did a great job. Putting it on the cabinet doors adds so much! 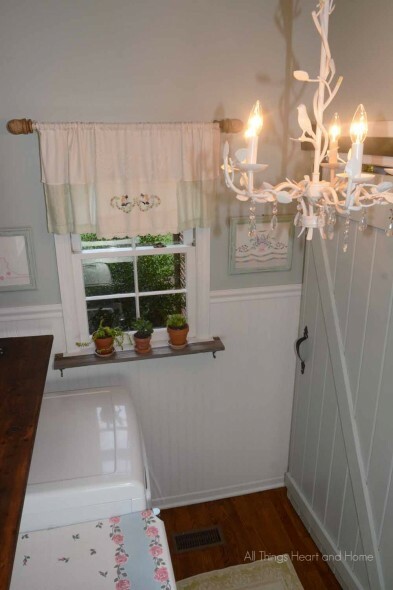 Thank you so much Sondra…bright is good for a laundry room isn’t it friend xo? Your laundry room looks lovely! 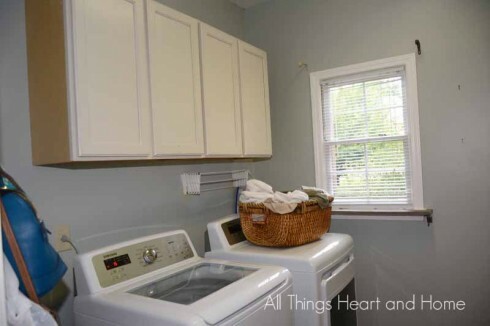 I’m so in need of a laundry room makeover! Thanks for the inspiration. Love this – I would like to know where you bought the rolling hamper & ironing board – great idea !! How did you trim the breadboard on the cabinets? Your room looks great! What a change! I can’t even say enough wonderful stuff about this room. First of all, every time I wash clothes, the gross stuff in the washing machine bothers me. I keep thinking I should clean it, but I haven’t. Now I will. And the chandelier–ohhhhh my goshhhhhh. Isn’t is the loveliest thing you’ve ever seen? Your cow. I’ve seen her sweet face (maybe it was on Instagram?) She’s just beautiful–I’d imagine you can look in those big brown eyes and smile–no matter what! I love her!!! Looks good. Not so bad. I love your blog! I love your laundry room. We are replacing carpet with flooring. We are trying to decide to go with hardwood or laminate. 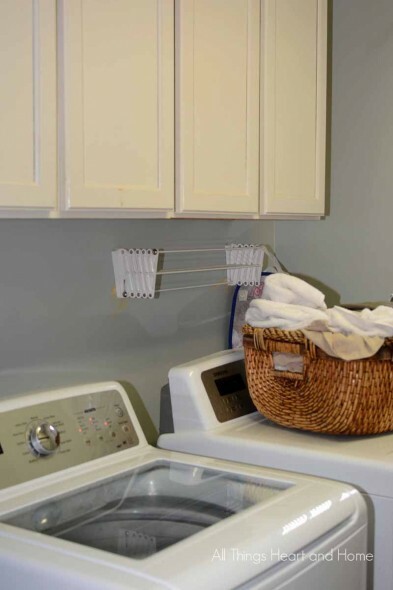 What is in your laundry room? I love it too! Thanks! I LOVE the hinged shelf above the washer and dryer. Did you ever post the tutorial for it?